What the Heck is a Lariat? There are about as many sizes, styles, and options for ropes as there are for cars. You can get them in a variety of lengths, colors, levels of softness, and made out of a range of materials. The main thing lariats have in common is that they are slightly stiffer than ‘regular’ rope. A lariat needs to be stiff so the loop will stay open when it is thrown, and so the person using it can open and close the loop easily with one hand. The standard rope you see used at most rodeo events is made of braided nylon and is between 30 and 35 feet. These ropes are almost always used in the sports of team roping and tie-down roping. The goal in both of these events is to rope the cattle as quickly as possible. Although these ropes can be used for ranch chores, it is common to have what is known as a ranch rope for work around the ranch. A ranch rope is a type of lariat that is much longer than its rodeo cousin. 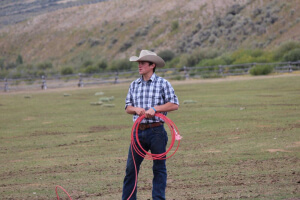 Ranch ropes can easily be between 50 or 60 feet long, and are generally not as stiff. Ranch roping is almost never the fast paced action you see in the rodeo arena. The big difference is that in ranch roping you have to deal with a herd of animals, instead of 1-on-1 in an arena. Ranch roping focuses on accuracy and controlling the movements of the animal. Much like a baseball player, ranch ropers employ a variety of different throwing styles. There is everything from your basic over hand throw to something called Johnny Blockers*. You might be thinking that this all sounds good and well, but that it seems like an awful lot of work to learn how to lasso something. You would be right, but at Goosewing Ranch we would be more than happy to teach you. 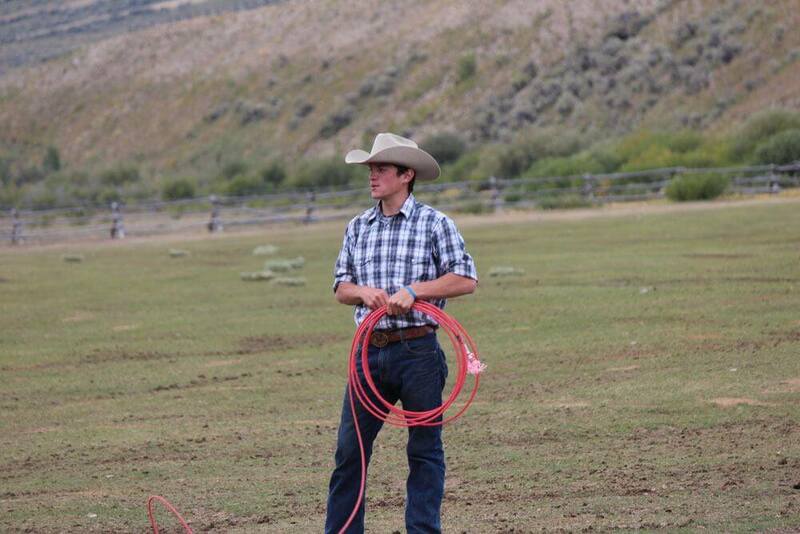 I have taught many people how to throw a rope in Jackson Hole Wyoming and it always seems like everyone else picked it up faster than I did. If you can throw a ball of any kind, I know we can get you lassoing something. I’m sure by the time your guest ranch vacation is coming to an end you will be hard pressed to stop lassoing your spouse, child, or dog. (In fact I can almost assure you that they will be politely asking you to stop). *A Johnny Blocker is where you throw the lariat slightly in front of the calf, and then pull the loop back onto their head.